Well, this certainly didn’t work the first time it was tried in Berlin, Germany during the cold war… but then the Bush administration’s failed Iraqi invasion has often ignored the lessons of history, the advice of the military and public opinion in the occupied country and here at home. How in the world could constructing a wall around the Sunni neighborhood of Adhamiya in Baghdad do anything but increase polarization and violence in the city? It shuts workers off from their jobs, separates family-members, and becomes a living symbol of imperialist dominance of an occupied nation. “The Americans will provoke more trouble with this,” one resident, Arkan Saeed, told the BBC. “They’re telling us the wall is to protect us from the Shia militia and they’re telling the Shia they’re protecting them from us. Isn’t this what we saw with the Berlin wall? Aren’t we seeing this with the Israeli security fence? Who’s bright idea was it to repeat another strategy that has been proven wrong in the past? One failure after another. When will Congress stop this madness and end this senseless imperial occupation?? Iraq’s prime minister said Sunday that he has ordered a halt to the U.S. military construction of a barrier separating a Sunni enclave from surrounding Shiite areas in Baghdad after fierce criticism over the project at home.The challenge to the U.S. initiative came as Prime Minister Nouri al-Maliki began a regional tour to shore up support from mostly Sunni Arab nations for his Shiite-dominated government as sectarian violence persists despite a nearly 10-week-old security crackdown. U.S. military spokesman Lt. Col. Christopher Garver declined to comment on whether construction of the wall would stop, saying only that all security measures were constantly under discussion. “We will coordinate with the Iraqi government and Iraqi commanders in order to establish effective, appropriate security measures,” he said. 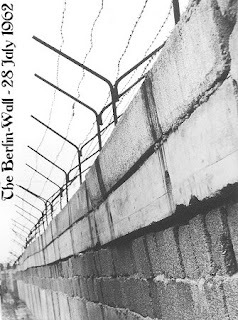 The Berlin wall seems to offer no lessons here: it was built by tyrants to keep inhabitants from escaping. The Israeli wall seems to offer only half a lesson: It keeps people on one side ruled by tyrants from sneaking to the other side where they implement mass murder and destruction on people living otherwise orderly lives ruled by a democracy. The wall in Baghdad was designed to keep people from each side going to the other and implementing mass murder and destruction for a variety of reasons, one of which is to prevent anybody from establishing a civilization based on modern concepts such as self-ownership, personal liberties, and consent of the governed. As for this wall representing “imperialism”, this article contradicts that conclusion: the Iraqi president, who certainly was not favored by Bush in his election, has decreed an end to the wall, and his decree has manifested. The Iraqi president is standing up to the US because his own survival (both political and physical) require it. The US, however, has not confirmed that they will halt construction. Let me get this straight: This supposedly US-controlled act of imperialism places the Iraqi president in a situation where his physical and political survival depends on standing up to the US. And because of the president you voted for, it’s growing weaker by the minute.